BASIL is working towards creating a network of community gardeners and farmers that help sustain the local ecology via acclimating seeds to their ever-changing environment. BASIL also shares seeds with the community as well. Green Thumbs, Green Minds lends seeds for free. In return please save seeds from the plants you grow. Then, donate some of the seeds you save to the library. Friday and Saturday: 10-5 p.m.
Renee's Seeds donates seeds to educational programs and organizations every year in an effort to help encourage organic and sustainable gardening. Renee's Garden also has a fundraising program called Renee's School and Nonprofit Program. 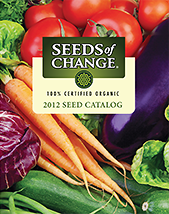 Sell Renee's Garden seeds and 25% of those proceeds will go towards your school or nonprofit organization. Feel free to borrow seeds and return some when you harvest your crops. Monday and Tuesday: 12-7 p.m.
Friday and Saturday: 12–5 p.m. Borrow seeds from library. Plant them. Grow plants. Harvest seeds. Donate some of the seeds to the library. Seedfolks' is connecting and empowering communities through seed saving. Wednesday, Thursday and Saturday: 10-5:30 p.m. SEEDS of CHANGE an organic seed company, is offering free organic seeds as a part of their 2012 “Sowing Millions, Growing Minds” initiative. Please help create and/or continue growing organic gardens in schools!